Olympic champion Allyson Felix won the 200 meter yesterday in Berlin for her 3rd straight world title. When she crossed the finish line Felix pumped her fist as an expression of her accomplishment. She is the 1st female to ever hold the world title 3 times. It was also a big victory for the United States as they have struggled with the Jamaicans recently. Allyson defeated Jamaican Veronica Campbell-Brown from Jamaica. Campbell Brown took the early lead but Felix made some adjustments and powered by her. The United States jumped over the Jamaicans in the medals race at Olympic Stadium with 6 gold medals and 16 medals overall. The Jamaicans are in 2nd place with 5 gold medals and 10 overall while Russia is 3rd with 4 gold medals and 11 medals overall. 4U Management has 2 clients participating in this week's Tar Heel Tour event. Mark Harrell and Martin Ureta are both participating in the South Charlotte Classic which has a purse of $220,000. Going into this week's Wyndham Championship, held at Sedgefield Country Club in Greensboro, North Carolina, Lee Janzen holds the #86 spot in FedExCup Points. The Wyndham Championship is the last tournament before the top 125 players advance to the FedExCup Playoffs, beginning on August 24 at The Barclays in Jersey City, NJ. The FedExCup Playoffs is a four tournament, progressive cut event in which the field is narrowed from 125, to 100, to 70, then to the top 30. The Champion will be crowned at THE TOUR Championship presented by Coca-Cola in Atlanta, Georgia Sept 24-27. 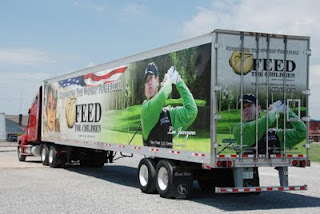 Lee Janzen is an avid supporter of Feed The Children and assists with food drops throughout the country while playing on the PGA TOUR. Above is a photo of one of the semi truck used to deliver food to hungry children and families in need. 4U Management's Ben Crane had a payday of $177,225, finishing T6 at the Buick Open. Way to go Ben!